Welcome to May in my autumn garden. It's late autumn and while there are a few brave souls soldiering on, many of the summer flowers are at last fading. 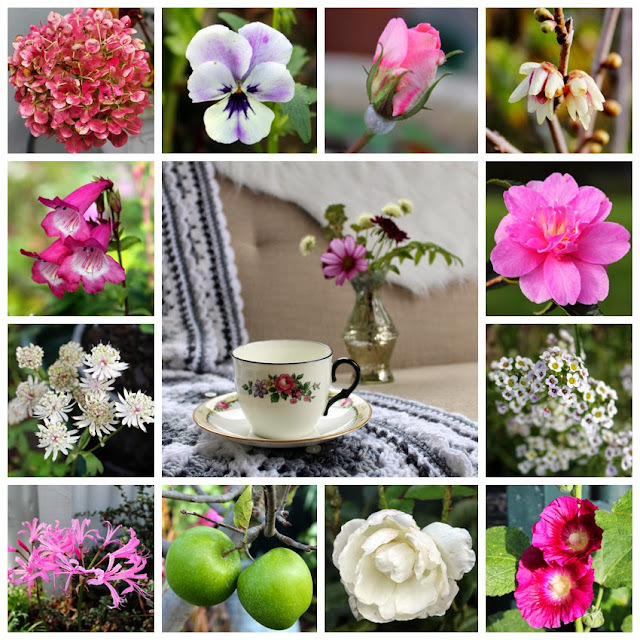 Winter isn't my favourite, but I always embrace the change of season - with the emphasis on change, meaning a new range of blooms for enjoying and picking. New this month is the wintersweet, a seasonal delight and something that always gets me through the first month of winter. My camellia Elfin Rose is still going and looking lovely when backlit by the sun, and I hope the rest of my camellias won't be far behind. Clockwise from top left: autumn coloured hydrangea, cheerful pansy, possibly the last rosebud for the season, the first wintersweet for the season, Elfin Rose camellia, sweet alyssum, hollyhocks, a late rose, Baujade apples, nerines, astrantia, pink penstemon. I kind of missed Bloom Day this month (time is flying by lately) but I'm linking up now, I'm number 100 so there are plenty of other gardens to check out if you click the link!